What happens when drain flies invade an entomologist’s bathroom? An experiment happens, of course! Find out the results of using a bacterial drain cleaner product to control a moth fly infestation. Fig. 1. A mosquito breeder container was placed over the bathtub drain to trap any emerging adult moth flies. Even an entomologist can be annoyed by a moth fly infestation in his own home. An occasional fly seen receives the usual smack-down, but more than a few day after day prompts a call to investigation and action. This article details my experience in testing the ability of a bacteria-based drain cleaning product to control a moth fly infestation within my home. INDENTIFICATION AND BIOLOGY. Moth flies belong to the Diptera family, Psychodidae, and are easily recognized by their hair-covered bodies and wings. A more diagnostic feature, however, is the vein pattern in the wings with all the veins running parallel to each other from base to tip. The color can vary from gray to black to tan, depending on the species. The larva is also distinctive with its long, thin, gray body complete with a cylindrical “siphon” tube at the tip of the abdomen. This tube is used for breathing as the larvae prefer to live in wet, even aqueous, environments enriched with organic materials. The larvae crawl, or swim, while mostly submerged or covered by moisture, the siphon tube extended at times through the water’s surface film to draw in air. These flies are most commonly known as drain flies in the pest control industry as they are usually associated with drains, grease traps, and sub-slab drain leaks. Any area wet enough and containing greases and other organics can serve as a breeding site. In commercial settings such as a restaurant kitchen, I’ve found this fly breeding underneath pallets, gallon soap bottles, and other items that sit long periods on the floor. I’ve also seen them in sump pumps, wall voids, grease traps, and in pools of water puddled on the floor under equipment and along baseboards. But it is in drains and drain lines of any kind and in any type of building where moth flies are prevalent. Drain flies: these troublesome insects are easily recognized by their hair-covered bodies and wings. THE PROBLEM STARTS. I first began noticing a few moth flies in my home’s guest bathroom during late summer in 2012. The likely source was the bathtub drain which, because this tub is rarely used, the drain trap in the pipe had dried out allowing any flies living within the drain line or sewer beyond easier access into the home. After adding water into the drain to refill the trap, and repeating the process periodically thereafter, I resolved the fly issue. During the summer of 2013, however, the flies returned, this time in greater numbers. I placed the top half of a mosquito breeder container (Fig. 1) (available from www.bioquip.com) over the bathtub drain and a second breeder top over the overflow cover to trap any emerging adult moth flies. The breeder top contains an inverted funnel which allows flies to fly up and become trapped. The traps were monitored over the next several days and collected a few dozen flies in both traps, not surprising since the overflow is connected to the drain. No flies were captured from the bath sink drain. To remedy this fly infestation, I decided to test a bacterial drain product provided for field testing to me. The product contained a specialized formulation of bacteria that occurs naturally in soil, water, and decomposing plant materials. TREATMENT IS APPLIED. The bacterial drain cleaning formula in the product is nontoxic and non-corrosive, eliminates odors, and consumes biofilms and organic buildup in drains, thus denying their access by fly larvae for food and shelter. The label directions for drain application directed that 4 fluid ounces be applied directly into all affected drains every other day for seven days and then 4 fluid ounces once per week thereafter. For the moth fly issue in my bathroom, I added the 4 fluid ounces in the bathtub drain, the sink drain and flushed 4 fluid ounces down the toilet every other day for seven days and once per week thereafter for two months. I continued to monitor numbers of flies captured using the mosquito breeder tops over the bathtub drain. RESULTS. After consistently catching numerous moth flies daily prior to treatment in traps over the tub drain and overflow, fly captures dramatically reduced beginning on Day 1, and by Day 4, new activity had ceased emerging from the tub drain. No new flies were captured from the tub drain for the remainder of the eight-week test period. Starting about four to five weeks after the initial treatment, however, an occasional moth fly was discovered in the bathroom. Subsequent monitoring of drains using the breeder traps in the other downstairs bathroom and shower drains revealed no fly emergence from those locations. When moth fly activity continues after drains have been cleaned/treated, the probability of a sub-slab drain leak or other non-drain breeding source is likely. My house being a monolithic slab, the possibility for stress cracks through the slab under tile and other floor coverings is highly possible. In addition, a bath trap under the tub could allow flies to breed underneath if a plumbing leak exists. Examination of the bath trap under the bathtub in question revealed no signs of activity. As the weather cooled into fall, moth fly sightings ceased altogether. RETURN OF THE FLIES. By late summer of 2014, the moth flies returned in greater numbers in the same bathroom. Renewed monitoring (using the mosquito breeder traps over the tub drain) resulted in capturing more than 60 moth flies in two days (Fig. 2). Fig. 2. Renewed monitoring with a mosquito breeder trap resulted in the capture of more than 60 moth flies in two days. Treatment was again instituted using bacterial drain cleaner product applied per label directions. Activity captured in the traps dropped to one fly captured in traps on the first day after the initial application and a second fly captured on Day 3. Fly activity from the tub drain into the traps was zero thereafter. Activity within the bathroom itself, however, continued with several new flies seen daily, with as many as up to 10 flies seen in a single day (each fly found was captured into a vial of alcohol). Inspection and trapping revealed no other drains in the house to have fly activity. Given the numbers of moth flies captured within the original bathroom and the fact that moth flies are weak fliers, a secondary, non-drain breeding source was now well established in that bathroom. Two possibilities for this source existed: (1) the toilet was leaking or (2) the drain line under the bathroom floor was leaking, resulting in a sub-slab infestation which could prove expensive to correct. THE SOURCE REVEALED. 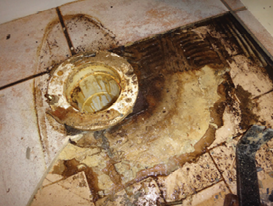 The toilet was pulled revealing that the wax seal had failed and was allowing contaminated toilet water to leak under the ceramic tiles of the floor. Since the tile floor in this bathroom was due to be replaced as part of a larger remodeling project in my home, several of the tiles in the toilet area were removed revealing dozens of moth fly larvae and water underneath (Fig. 3). Tape was placed along the cracks at the bottom of the baseboards around the toilet area and along the bottom edge to the side of the tub to ensure whether moth flies were also breeding in these sites. Any flies trying to emerge along those cracks would become attached to the adhesive on the tape. A mosquito breeder trap was also placed over the toilet drain line to determine if moth flies might also emerge from that drain line (which is attached to the tub drain). No flies were captured from the toilet drain line or on tape from along baseboards and the bathtub. The only solution to a situation such as this is clean-up and repair to eliminate the moisture and thus, the breeding site. The floor tiles were taken up completely from around the toilet area, and the excess water and fly larvae removed using a wet/dry vacuum followed by an electric fan installed to dry the area overnight. Once the area was thoroughly dry, all the floor tiles in the bathroom were removed (as part of a remodel project). The toilet mounting ring was then removed from the drain line revealing a crack between the slab and the drain line. Moth fly larvae were seen actively moving between the drain line and the concrete indicating that some breeding activity was present immediately beneath the slab at the drain line location. Fig. 3. Several of the tiles in the area of the toilet were removed revealing dozens of moth fly larvae and water underneath. The bacterial drain cleaner product was applied beneath the slab through the crack around the drain line using a small compressed air sprayer equipped with a C&C injection tip. Approximately 4 fluid ounces was applied in this manner twice before sealing the crack using a heavy-duty silicone sealant and installing a new toilet mounting ring. The bacterial drain cleaner was also applied down the toilet drain line while it was open in accordance with label directions. Once the drain lines had been treated as described above and the toilet leak repaired and new tile floor installed, fly activity ceased in the bathroom. To date, only a few moth flies have been found in the house since, prompting an application of the bacterial drain cleaner product into the bathtub drain for about 1 week after each sighting. DISCUSSION. The nickname “drain flies” is well-earned by the various species of moth flies. Most all structural infestations are associated with drains or sump areas, although any wet area containing organic materials can create a breeding source for this fly. My original moth fly problem likely originated in the bathtub drain line. The leaking toilet introduced organic materials and water beneath the tiles thereby permitted a secondary breeding site to develop within the bathroom. The bacterial drain product proved to reliably and quickly resolve fly activity in the drain lines, dropping fly emergence from the drain to near zero after one application. In my case, I did not maintain continuous use of the bacterial drain product over the winter and spring which allowed a population to rebound inside the drain line. These new moth flies emerging within the bathroom subsequently discovered and established the secondary breeding site associated with the toilet leak under the tile floor. This experience showed that a bacterial drain cleaner product when applied to label directions and continued on a regular basis can effectively control and potentially eliminate a current moth fly infestation in drains and help prevent flies from breeding in and emerging from drains. Should moth flies persist in being seen within the structure, an investigation should be conducted to determine if and where any secondary breeding sites might exist. In commercial situations, the most likely candidates will involve plumbing leaks around toilets, within pipe chases in walls and floors, or in the soil under slabs. In commercial kitchens that clean their floors with a high pressure water hose, fly breeding may occur under ovens, stoves, tables, and dishwashing machines where washwater and organic materials and grease accumulate. Bacterial cleaning products provide a beneficial tool in a small fly control program to consume organic materials used by flies as a food source, such as sugars and greases, where they may accumulate in cracks, voids, and drains. Moth flies and other small flies will regularly be an issue in commercial kitchens, food processing environments and occasionally in office buildings, schools, homes and other buildings. Where the threat for small fly incidence is high, engaging the customer to utilize a bacteria-based product as their drain cleaning and floor cleaning agents will help minimize and even eliminate the organic material build-up on which these flies breed, thus greatly reducing the chances of small fly issues. The author is with Stoy Pest Consulting, Lakeland, Tenn.